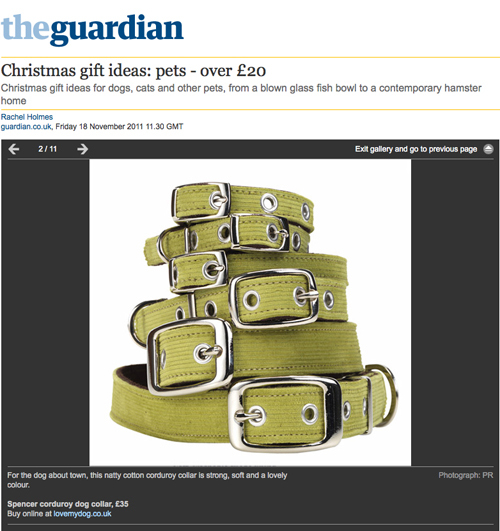 Check out our festive red velvet leads as modelled by a pair of… foxes! 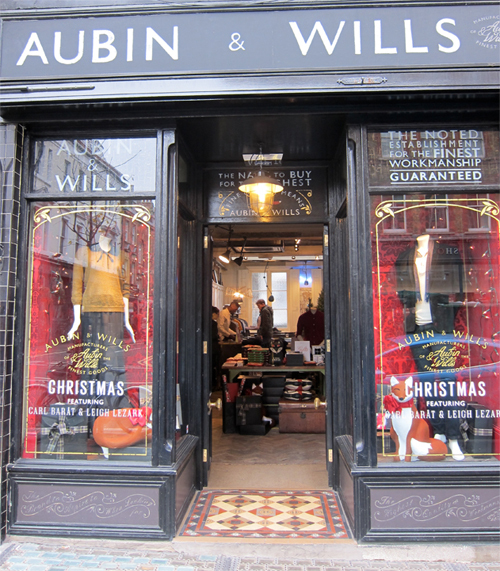 Aubin & Wills offer classically inspired, contemporary British clothing for men and women. Their Christmas window displays look great, with all the UK store windows featuring foxes wearing LoveMyDog Princelet red velvet leads. Let it Snow! 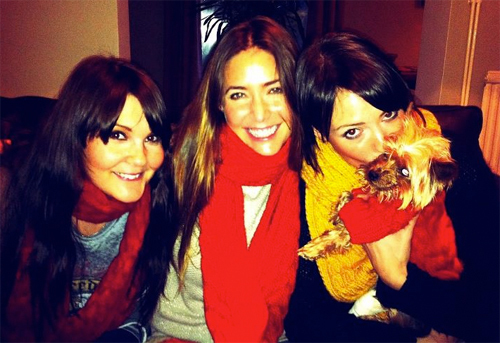 The stunning Snowdon sisters have got Christmas all wrapped up with hand-knitted scarves from the LoveMyDog Wilmot collection, and of course, a matching Wilmot sweater for Rocco too. 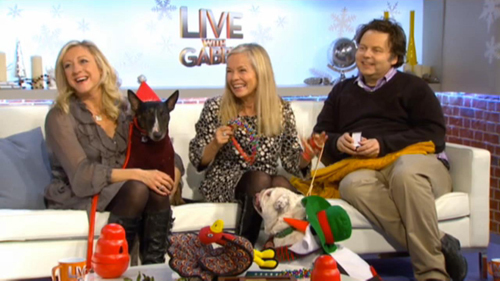 Our friends at Barking at the Moon featuring our Wilmot Scarf & Sweater Collection on Live With Gabby Channel 5 this week. Don’t worry if you didn’t catch Anna Webb & Jo Good on the show, you can still listen in to catch all their best Canine tips for Christmas here. 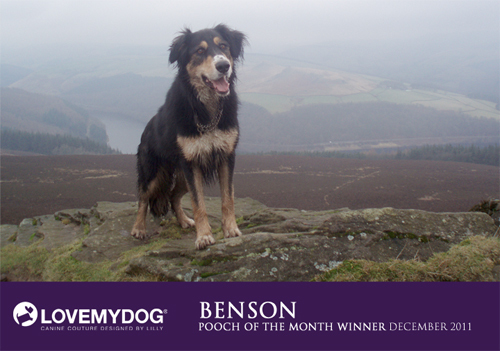 Congratulations to Benson, the LoveMyDog Pooch of the Month for December 2011. You can have a look at all of the recent entries here. Why not send us your pooch pics? You could win something from the LoveMyDog collection, and all the monthly winners are entered into a draw to win a bespoke fitted dog coat worth £1000. Its really easy to enter our Pooch of the Month competition, just enter via the competition tab on our Facebook page. We love reading the Sunday papers, especially after a good long walk. 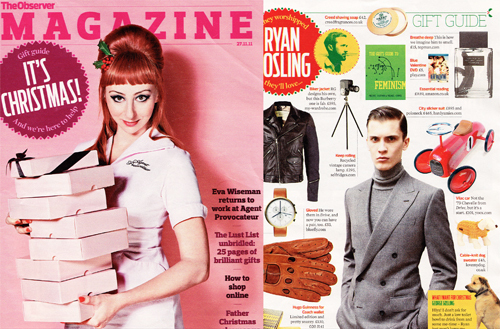 We especially enjoyed The Observer and the Ryan Gosling page this weekend as our Wilmot Cable Sweater was featured in their Christmas Gift Guide. 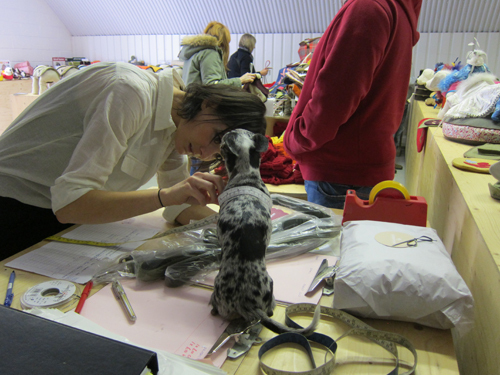 The LoveMyDog studio opened its doors for another ‘Open Studio’ on Saturday. Thanks to all those who came along and said hello. Rabbit made lots of new friends and we hope that all the wagging tails meant that lots of dogs were happy with their new sweaters, coats, collars and leads. 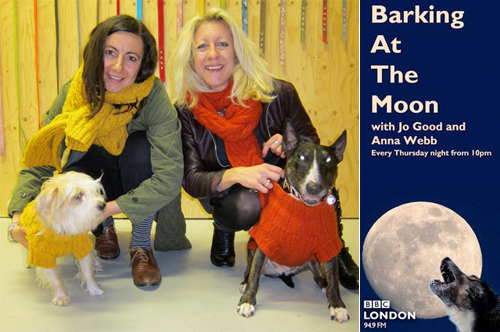 Anna Webb from the BBC Radio team Barking at the Moon came along to the LoveMyDog studio last week. Lilly & Rabbit were very excited about the visit and we all thought Anna’s minature bull terrier Molly was adorable! Barking at the Moon is the dedicated dog slot on the radio. Presenters Jo and Anna discuss the latest books, films, gadgets through to tackling burning issues in the dog world! Their guests have ranged from Bryan Adams to elusive fashion guru Kath Kidson, as well as many top journalists and authors. You can listen to the show every Thursday from 10pm on BBC London 94.9FM. 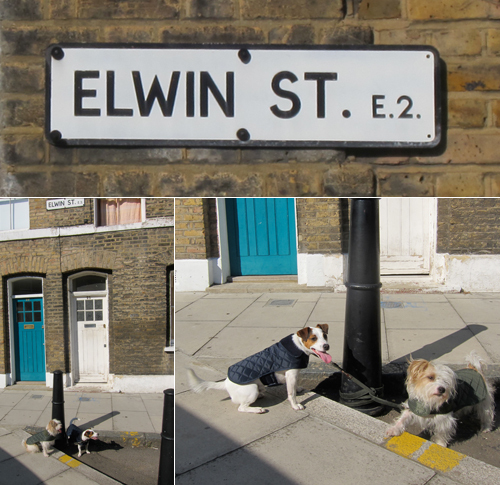 Lilly loves East London, and the inspiration for the name of these particular deluxe doggy raincoats came from a local road called Elwin Street. Rabbit (sporting the olive coat) certainly enjoys his walks there with his friends. This classic waxed cotton coat caused quite a stir in the canine community when it was featured in the “Truly British Pet-a-Porter Dog Fashion Show” at Harrods London, alongside creations by Vivienne Westwood and Ben de Lisi. Waterproof, windproof and snug, it’s truly a dog coat for all seasons. The Elwin doggy raincoats are available in navy or olive, and in a range of sizes. For more details click here. The images above were created by the talented Anna Walsh. 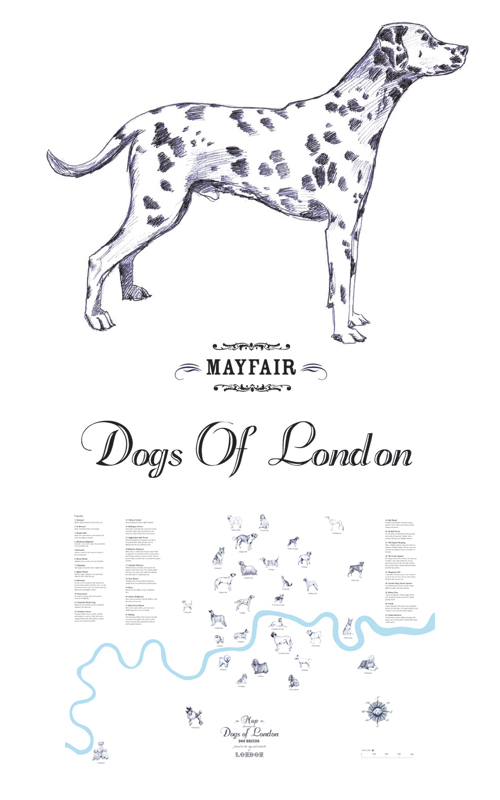 She has exhibited around London and we think her ‘Dogs of London’ Map, and hand coloured individual dog prints are fab. You can see more of Anna’s work at her website here and a larger version of her Dog Map (sadly no Rabbit for Hackney) here.